After taking December off from this monthly roundup of fandom fashion, I’m back. 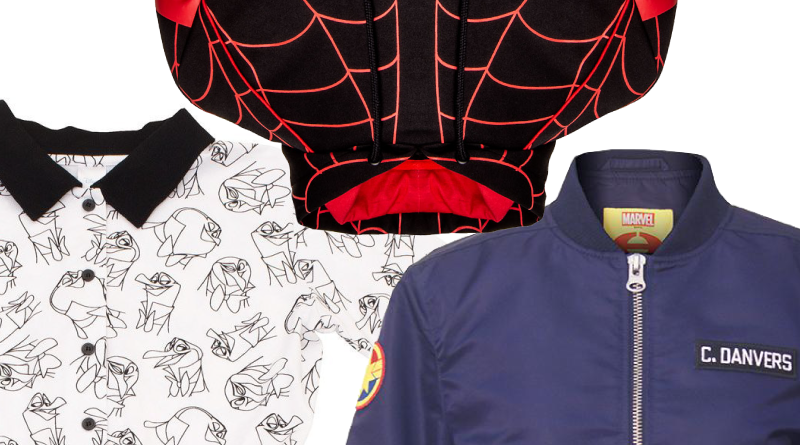 It’s hard to turn off the release watching for this stuff so you’ll find some December finds sprinkled in with my top picks for geek fashion from January 2019. Enjoy. If you’re looking to get your Mary Poppins-esque style on, Unique Vintage has a collection just for that (prices vary). Hot Topic has Mary Poppins Returns Cosplay Shoes ($74.90) and Cosplay Umbrella ($29.90) to complete your ensemble. Meanwhile the Her Universe collection for the movie includes this great Mary Poppins Returns Girls Coat ($108.90) (Plus). You’ll also find a Penguin Waiters Dress ($39.95) over at Cakeworthy. I like the shirtdress style with the sketches making up the pattern. AbbyShot has a pre-order open for their 13th Doctor Replica Coat ($299.99). They’re making a men’s version in addition to a women’s version and need 100 pre-orders by February 14th for a version to run. Late spring/summer 2019 delivery is expected. 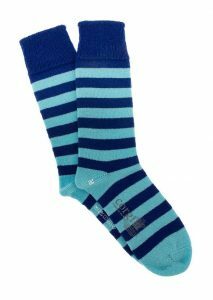 On their site you’ll also find 13th Doctor Socks ($39.99) – the same cashmere blend striped kind Jodie Whittaker wears in the show. Both ladies and men’s sizes are available. Also in the realm of Doctor Who, Her Universe has a cute Thirteenth Doctor TARDIS Stripes Wallet ($24.90) that combines the stripes of the Doctor’s shirt with the outside paneling of the TARDIS. Captain Marvel is on her way this March and the Our Universe label has a Marvel Captain Marvel Olive Womens Jacket ($64.90) over at Box Lunch. It looks like it has a loose, boxy fit but my favorite part is the embroidered Captain Marvel star on the back with frayed edges. For kids, Shop Disney has a bold red, blue and gold Captain Marvel Jacket ($34.95) with a star zipper pull. 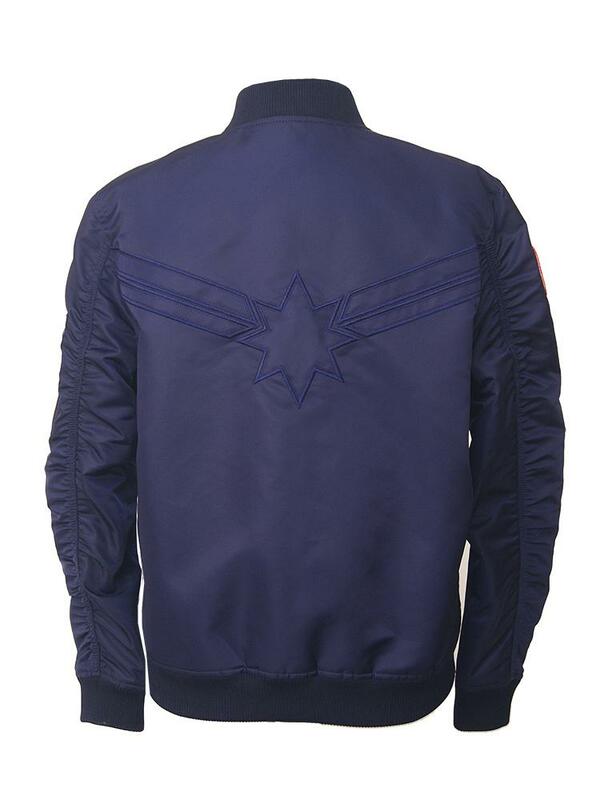 Hero Within has opened pre-orders for their Captain Marvel Flight Jacket with a special price ($119). It looks nice and I’m liking that it has so many pockets. Delivery is expected in March for this one. Also check out: Captain Marvel Hair Sticks ($14.90), Captain Marvel Logo Pendant Necklace ($9.90), this Actually, I Can Captain Marvel Tank Top ($25.90 – $27.90), and the pre-order for the Captain Marvel Premium Hoodie ($72.99). Box Lunch has an exclusive Leia design in their Princess Leia Love T-shirt ($28.90). 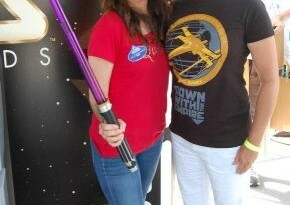 It’s clearly meant to go with their new Han “I know” shirt, but I like it on its own with the simple outline of Leia in front of the Rebel starbird. It’s unisex sizing too. There’s another neat outline/sketch style Leia tank over at Shop Disney called the Princess Leia Tank Top ($22.95) that just says Rebel on it. I appreciate that that one is printed using eco-friendly, water-based inks. 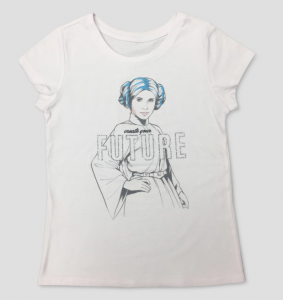 And I’m sad that this Create Your Future Leia Tee ($8.99) is only in kids’ sizes at Target. Shop Disney also has a Rebel Alliance Hooded Dress for Women ($49.99) that’s got some nice sporty style and a pattern-mixing Star Wars 90s T-Shirt for Men ($26.95). If you prefer to keep your Star Wars 90s-style prints more private, you’ll enjoy the lining of this otherwise straightforward Star Wars Zip Jacket for Adults ($49.95). Merchoid has pre-orders open for both a pullover Mile Morales Spider-Man Hoodie ($60.99) and a zip-up Spider-Gwen Hoodie ($58.99). Nike also launched the Air Jordan Origin Story sneakers ($160). 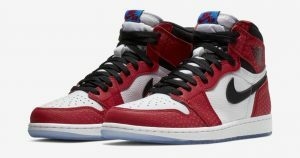 They’re already sold out but I’m still celebrating them here because they’re the shoes Miles wears in Into the Spider-Verse and it’s cool when movie apparel gets brought into the real world, especially from animation. Shop Disney has a kids’ Spider-Verse sneaker ($24.95) but it’s not quite the same. There’s also a bunch of character shirts available at Hot Topic – this design (women’s cut) ($22.90 – $26.90) is a particular standout. Her Universe has a cool-looking Overwatch Mercy Jersey Girls Moto Jacket ($69.90) (plus size at Her Universe $74.90) that’s light-colored with fairly subtle embroidery. I like the mix between the structure of the style and the softness of the jersey fabric along with the detail of the gold flecked panels on the underside of the sleeves. More Studio Ghibli keeps quietly appearing from Her Universe including this My Neighbor Totoro Embroidered Mesh Girls Open Front Cardigan ($44.90) at Hot Topic. I like its black and gray color combo along with the sweet embroidered scene on the upper back of the cardigan. It’s styled really nicely on the Hot Topic website too. Terez is celebrating the Mickey/Minnie anniversary with a new collection. There are girls and women’s sizes. Surprising no one, my favorite is the subtle inclusion of the mouse heads in the polka dots of the Mickey Mouse & Minnie Mouse Polka Dot Foil Tall Band Leggings ($96). A close runner up is the Give A Hand To Mickey Mouse Knit Sweater ($82); it’s a fun print on a drapey top. Linda has previous reviewed Terez leggings right over here. Her Universe also has a new Destination Disney Collection both at Hot Topic and on their own website. Eye-catching pieces include the Speak Fluent Disney Button-up Girls Long-sleeve Top (Plus) ($28.90), Disney Days Castle Key Necklace ($11.90), and the Disney Icons Soft Shorts (Plus) ($16.90). January 31st is the last day of Po-Zu’s current up-to-70%-off sale. Use this banner to get there and when you buy you support the monthly fashion roundup at no additional cost to you. Kristi Siedow-Thompson, one of the winners of the 2018 Her Universe Fashion Show has a 6-part blog series called So You Think You Can HUFS: An Insider Guide to the Her Universe Fashion Show sharing insights from herself as well as other designers. Currently in addition to the intro the following entries are available: Creating A Concept Part 1: Push the Drama, Creating A Concept Part 2: Submitting Your Design, Getting in: Construction, Execution, and Project Management. Whether you’re interested in entering or just curious about the work that goes into this show, it’s an interesting read. Jordandené has brought back sweatshirts to their offerings in five different styles. 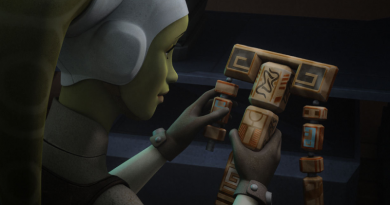 StarWars.com has a roundup of Star Wars active lifestyle items which includes wearables as part of their Fuel Your Force campaign. Vogue and Disney teamed up to show off street style at Disney Parks. 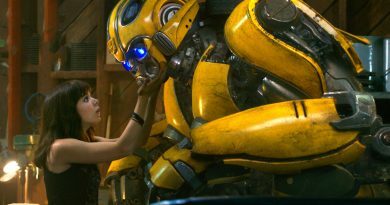 Learn more on the Disney Parks Blog and check out the full gallery on Vogue.com. Thanks for reading this month’s roundup! 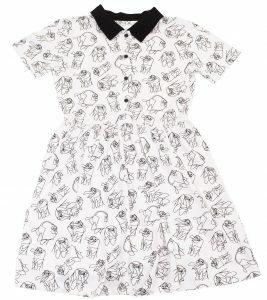 Is there a fandom you’d like me to keep an eye out for fashion for? Let me know in the comments. Want to say thanks for a helpful find? Looking for more fashion finds? Check out my October and November picks. What about Elhoffer Design’s Corps Dress or her Spiderweb Cape and oversized cropped sweater?